Brisbane is always willing to embrace new friends, and this week we welcome the new kid on the block. Billing itself as a bakery by day, bar by night this friendly venue will make you feel right at home in neighbourhood Newstead. As a fast-growing and evolving city, Brisbane is always willing to embrace new friends, and this week we were lucky enough to welcome the new kid on the block before its official opening this Friday, August 9. Sure, we found him first, but enough playground tiffs - Chester has plenty to go round and we won't be risking this tasty friendship on a game of scissors, paper, rock. Chester Street's interior is striking. White and light blue brick tiles cover the walls and wooden tables rest on polished concrete floors. The place has a comfortable and casual garden vibe about it, with lights strung outside above the decking creating a great atmosphere. At centre stage is a menacing cobalt-blue oven, hand-built by a team of artisans and used daily for bake the delicious sourdough. 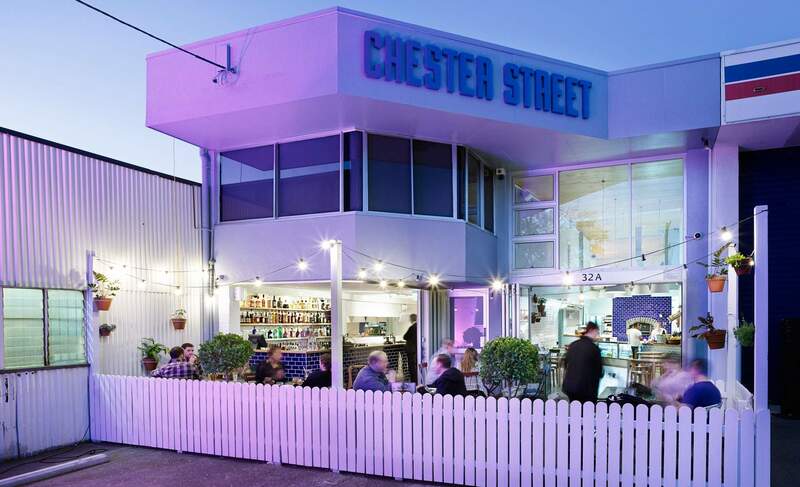 Chester Street is Damian Griffiths' (the man behind Alfred and Constance, Alfreddos and Limes) newest foray and we think his 'bakery becomes a bar' formula will be a hit with locals. Group patron chef Jocelyn Hancock has once again designed the menu to utilise fresh and local produce in the best possible way. With a European influence, a friendly offering of small tapas-style plates and entrees, a number of mains and finally desserts leave you with plenty of choice. Share the creamy hummus ($14) with spiced lamb, pine nuts and a serve of olive sourdough before ploughing into the lamb loin chops ($28) with green beans and a tomato, olive and caper salsa or the seared Cone Bay barramundi ($30) with cavolo nero and crushed potato (different to 'smashed' potato, obviously). An order of the Spring Creek Mountain chips, wood roasted in duck fat with truffle salt ($12) is a side you cannot pass up, and would regret doing so. The antipasto plate ($30) of local cheeses, cured meats, olives, oat cakes, quince confit and fruit loaf is the perfect accompaniment to the short but sweet wine list, and the braised leek and bacon croquette ($12) are, possibly, the best in Brisbane. For those with room for dessert, jump on board the chocolate and almond cake ($15) with espresso creme fraiche boat. This bad boy is as light as air and is hands down a winner. Controversially, I say the runner-up would be the toffee coated navel oranges ($15) dark rum syrup and orange cake, but you'll have to go and decide for yourself.